The Wiki article Wiki: User Experience Guidelines is a great resource for making all TechNet Wiki articles more useful. A good example is the use of cross-linking to improve the user experience. It helps users navigate the Wiki and find the information they need without searching. It leverages the information we author and makes it more discoverable. 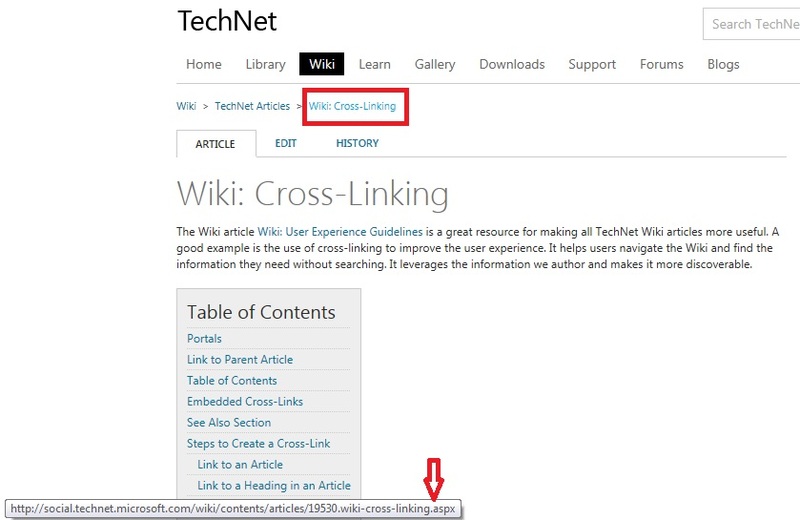 Portals are lists of links to TechNet Wiki articles in a given area or technology. 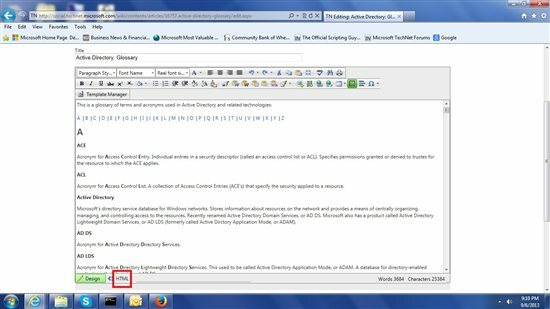 Portals can have sections for general overview articles, a section for articles describing how to install, setup, and configure the technology or product, a section for troubleshooting, etc. A user can be guided to the level of detail they need. 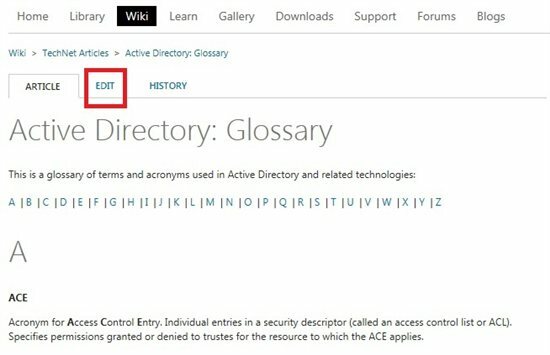 A TechNet Wiki portal should only have links to TechNet Wiki articles, unless it has a section for Additional Resources. These portals can link to additional portals for each individual technology. Each portal acts as a gateway to more detailed subjects. 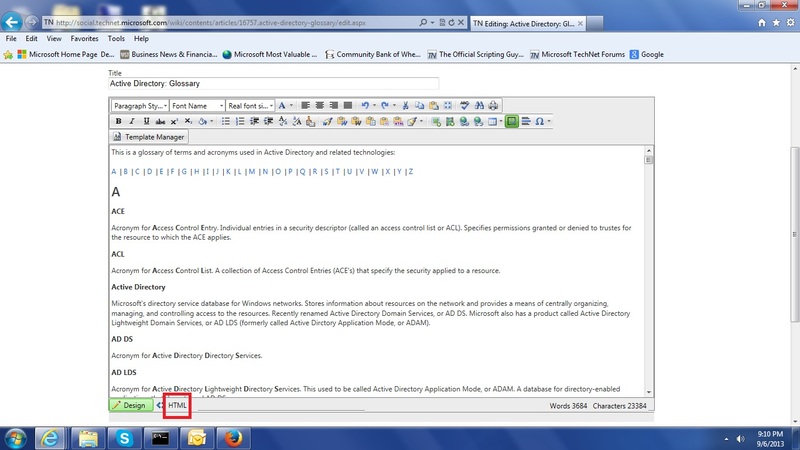 For example, the "Technologies Portal" above links to AD RMS Portal, which is the portal for that technology. If a Wiki article has a parent main topic article, it should be linked in the introductory paragraph. 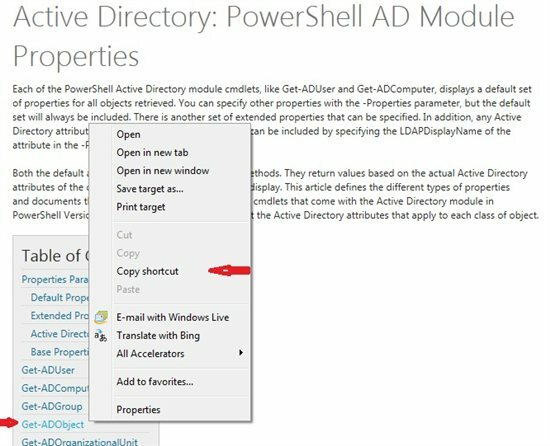 For example, the article Active Directory: PowerShell AD Module Properties defines the concepts of default and extended properties exposed by the PowerShell AD cmdlets (like Get-ADUser and Get-ADComputer). The article links to others with more details about the properties exposed by individual cmdlets. One of these child articles is Active Directory: Get-ADUser Default and Extended Properties. This article includes a link to the first article (the parent article) in the opening paragraph. The parent article should also be linked in the "See Also" section of the child article. As another example, note that this article includes a link in the first sentence to Wiki: User Experience Guidelines. Terms and acronyms in an article can be linked to information that defines the concept. Rather than explaining what every term or acronym means in every article where it is used, we can define each term in one place and leverage this in other articles. An embedded cross-link can refer to an article dedicated to a full explanation of the term. Or it can link to an entry in a glossary where many definitions are collected in one article. Only the first usage of each term in an article should be cross-linked. We should encourage authors to include a See Also section in most TechNet Wiki articles. This section would contain links to other TechNet Wiki articles related to the topic in a bullet list. Some articles would go into the subject in more detail; others would be articles on similar topics. NOTE: The See Also section should only link to TechNet Wiki articles. For links to other sources (Forums, TechNet Library, Blogs, etc. ), please include those links in the Additional Resources section. For purposes of this discussion, the article in which you are creating a hyperlink is referred to as the parent article. The link is a url (Uniform Resource Locator, or web address) to an article referred to as the target article. You can copy a link from one article to another. Of if you cannot find a link to copy, use the "Hyperlink Manager" in the Wiki editor to create links. 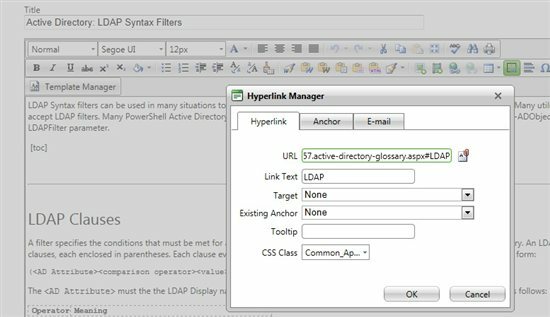 Highlight the text to be linked in the parent article, click the "Hyperlink Manager" button, and enter the url for the target of the link in the "URL" field. The easiest way to add a link to a Wiki article is to copy it from another article. The link can even be copied from a list of Wiki search results. For example, if the link you want already exists in the "See Also" section of an article, copy the link to your clipboard, then edit your article and past the link in the proper location. Notice above that the url shows at the bottom of the display when you hover over the title in the bread crumb. 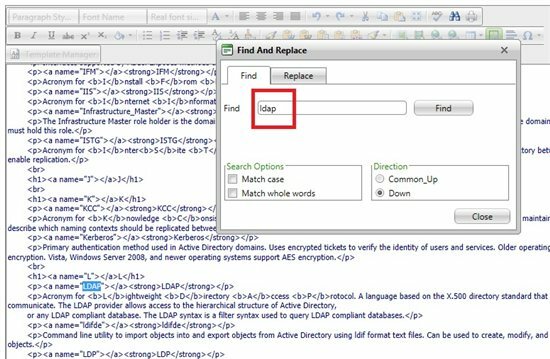 If you cannot find a link to copy, you will need to edit the parent article, enter the title of the target article in the editor, highlight the title, and click the "Hyperlink Manager" button. On the Hyperlink tab enter the url of the target article in the "URL" field. It can help to have both Wiki articles open in separate tabs or instances of your browser. First copy the title of the target Wiki article (so it is on your clipboard). Then edit the parent Wiki article and paste this title in the appropriate location in the article. Now switch back to the target article and copy the url of the article. 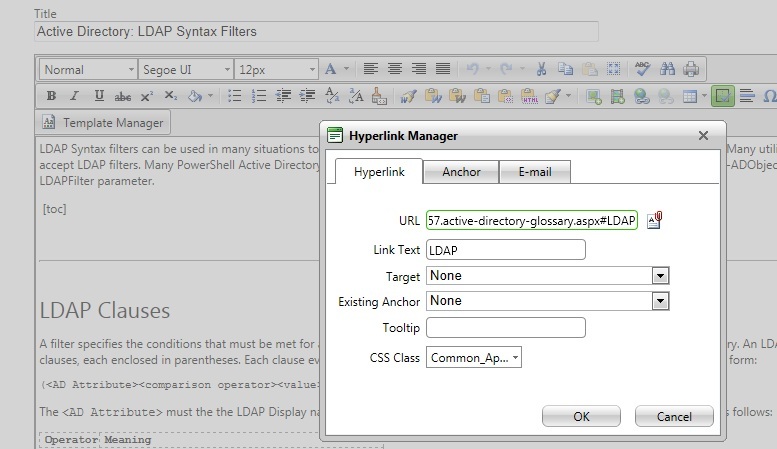 Switch to the parent Wiki article and click the "Hyperlink Manager" button so you can paste the url in the "URL" field. After you save the article, test the link to make sure it works as intended. You can also create a link to any term or acronym in an article, as long as it has a named anchor tag in the target article. For example, your parent article might use the acronym "LDAP". 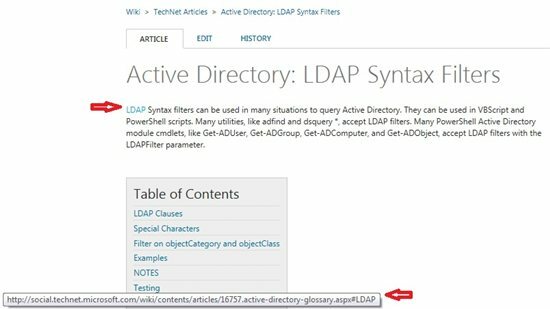 Rather than defining this in the parent article, you can link the string "LDAP" in the parent article to a definition in another target Wiki article, such as a Glossary. Unfortunately, it is difficult to determine the anchor tag name in this case. You must edit the target article (where the term or acronym is defined), switch to the HTML editor, find the term, and note the anchor tag name. If there is no anchor tag, you must create one. The url to the term will be the url of the article, followed by the "#" character, followed by the anchor tag name. 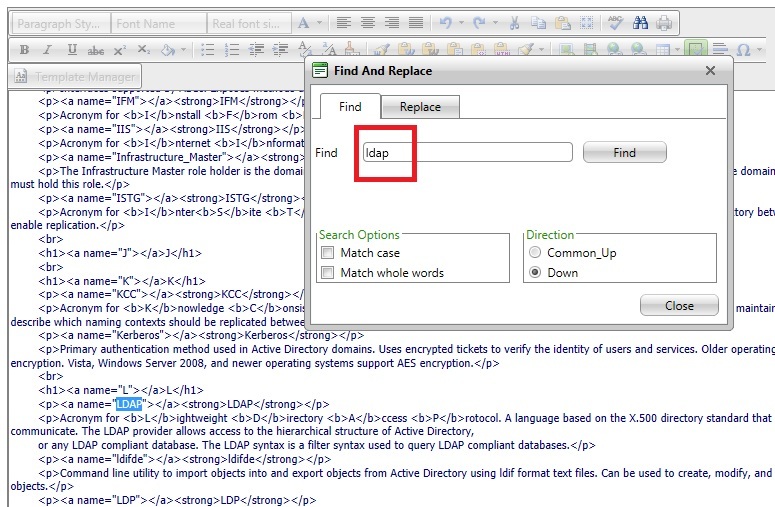 Note: The "Find and Replace" button is not available in the HTML editor if you use Firefox. This is a known issue.